We offer real, fun, high quality teaching that will allow your child to start his/her academic path with excellence. Open to everyone, regardless of the child's primary language, is our Bilingual Program. All classes are taught in both English and Spanish. Children learn how to read and write, are given instructions, and are encouraged to play in both English and Spanish. For children whose primary language is Spanish learning in both languages will make the transition to an English kindergarten easier. Young children learn a second language faster and with greater ease than adults. Wouldn't it be wonderful to give your child the gift of being bilingual? If your child's primary language is English our bilingual program will introduce your child to Spanish through immersion and direct instruction practices, however he/she will continue to learn important academic skills in English. Assessments are an important part of showing us what needs to be taught. Parents are kept current on student growth and personal goals. Students play in the playroom to practice social skills. Reading skills are developed through games, read alouds, direct instruction, whole group and small group activities. Individualized and small group instruction to meet individual needs are a daily part of our learning. 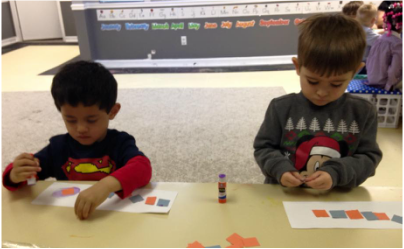 Math skills are developed through games, small group, and whole group activities. Language is taught through immersion and direct instruction. Students rotate through three rooms daily, spending one hour in each classroom: Spanish classroom, English classroom, and bilingual Playroom. ﻿Space is limited to 10 students per class.